Are you looking for a professional office for your business? Leave the hassle of finding and setting up an office to the experts! At Ideal Offices we allow you to rent affordable office spaces with professional services to assist in the everyday running of your business. We pride ourselves on being an Australian owned company that’s become well known for creating impressive office and boardroom spaces as well as offering our clients virtual reception staff, support systems and even bookkeeping. SRTV were delighted to find serviced offices on the Northern Beaches, and have now been located at Ideal Offices for a year, and can highly recommend this space. Over our time here time Keeley and the team have been highly professional and courteous to our staff and our visitors. As a start up business, our needs have quickly expanded, and they have been very accommodating, allocating extra space, organising additional furniture, space and office supplies, often at very short notice. I have been looking for help on the Northern Beaches with my photographic business for some time and Ideal Offices has been the ideal solution. I wish I had found Ideal Offices a long time ago. Ideal Offices have filled a huge gap in services on the Northern Beaches. They provide a much needed facility for small businesses and enterprises, by providing professional office support, excellent facilities and guidance in all aspects of business management. They’ve helped me immensely to establish and develop my professional practice. We needed a furnished office with high speed internet connection set up fast. Ideal Offices give us the flexibility and quick response to match our growing business. Our clients are also impressed with the meeting rooms, catering and reception from Sarah and Robyne. The Ideal Solution! 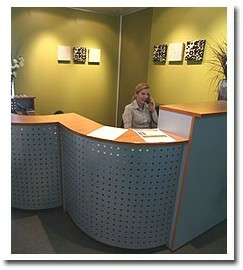 I first discovered Ideal Offices in 2007 and have since used many of their services. From an occasional ‘hot desk’ I advanced to serviced office space in 2008 and added other virtual services in subsequent years. We continue to use their administration services and find they are always very professional and take great care of our business needs. Keeley and the Ideal team are friendly, reliable and a pleasure to work with! Based in Brookvale, just 16 kilometres north-east of Sydney’s CBD, Ideal Offices is the leading provider of virtual reception services, as well as fully serviced office suites. Whether you’re a start- up or an established company, we can provide office space for rent that’s perfect for you. If you’re wishing to set up close to North Sydney, our modern amenities such as state of the art telecommunication services, meeting rooms and trained support staff are hard to pass up. We offer flexible rental options for a day, week, month or even a year! Because we’re passionate about creating the perfect serviced office space for your company, our efficient team will customise a space to fit within your budget and requirements. Let us show you how we can assist in accommodating to your businesses needs today, and as it grows in the future. Call us now so we can secure your business a professional and respected office space today.